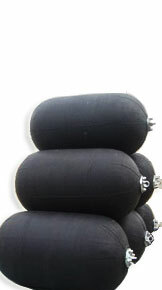 Pneumatic Rubber Fenders have been widely used for berthing structures as well as in ship-to-ship，Ship-to-Dock & Ship-to-Structure services. Due to its superior performance, major industries such as oil, mineral ore, offshore construction and drilling, fishing and shipbuilding, as well as port authorities and navies all over the world adopt and support it. All dimensions are approximate. Specifications are subject to change without prior notice. 2. R.F=Reaction Force; E.A=Energy Absorption. 3. Tolerance of reaction fore and deflection are as follows: Reaction±10%, Deflection ±5%. 6. Special sizes are available upon request. 7. Different levels of performance according to internal air pressure levels specified this fenders.